WASHINGTON, DC -- The United States Institute of Peace is a publicly funded national institution chartered by the U.S. government to promote international peace through nonviolent conflict resolution. Hadley, the former national security advisor to President George W. Bush, was an advocate for the 2003 invasion of Iraq and more recently appeared in the media to call for massive airstrikes in Syria. Over the last year, he has called for escalating the conflict in Ukraine. Hadley also called for European governments to broadly boost military spending, ideally doubling it. “You know, let’s show that Europe is going to have real commitment to military forces,” he said. “Arming Ukraine is a very bad idea,” says Stephen Walt, Professor of International Affairs at Harvard University. “If the U.S. Institute of Peace is just an Orwellian absurdity, then Hadley is an appropriate chairman,” says Connor. Scholars formerly affiliated with the Institute of Peace played down Hadley’s role at the institute. Hadley “seemed to me a natural as a Republican board member and as chair, but I was not privy to the selection process,” Serwer added. 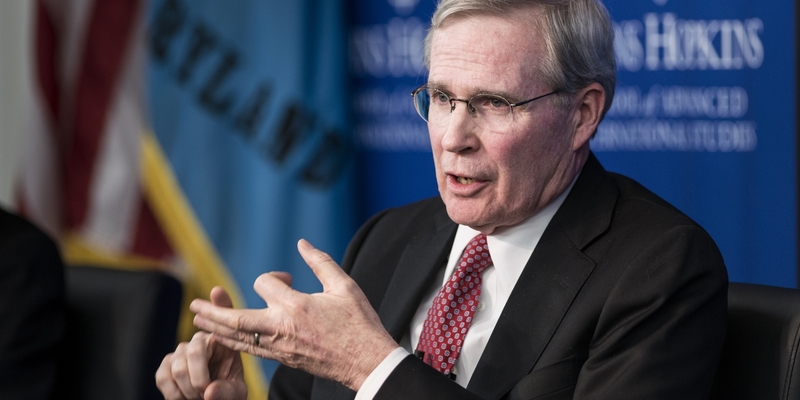 “I have a lot of respect for Steve Hadley and all the former national security advisors, so it doesn’t concern me,” says Tara Sonenshine, the former executive vice president of the institute. Hadley was nominated to the institute board by President Barack Obama in February of 2013. He joined the institute in August and was elevated to chairman of the board in January of 2014. The stock and trade of the institute includes regular lectures on conflict resolution, programs to facilitate cultural exchange, and research regarding international conflicts. The institute website highlights a “culturally-sensitive policing practices” grant for Israeli law enforcement. But it’s not the first time the institute has served as a platform for American hawkish foreign policy. Robert Turner, the first president of the institute and an appointee by President Ronald Reagan, voiced support for the right-wing death squads in Nicaragua known as the Contras. In more recent history, the institute’s board has included neoconservative leaders such as Daniel Pipes, an advocate for ethnic profiling and the invasion of Middle East countries. Eric Edelman, a current board member, has called for the Obama administration to hike military spending, for the U.S. to support an Israeli military strike on Iran, and for NATO countries to deploy nuclear weapons into former Warsaw Pact states that are now NATO members in an effort to confront Russia. In 2009, Hadley joined with other former Bush officials to launch a consulting firm now known as RiceHadleyGates LLC. Hadley also serves as a highly paid board member of Raytheon, a company that stands to gain from increased military assistance to Ukraine. Hadley has been a Raytheon board member since 2009 and was paid cash and stock awards worth $290,025 in 2014 alone. The conflict in Ukraine raised regional defense spending, a dynamic that has greatly boosted profits for Raytheon, which recently posted higher-than-expected quarterly earnings. Dave Wajsgras, Raytheon’s chief financial officer, told the Wall Street Journal that European states are hiking their defense budgets in the wake of tensions between Russia and Ukraine, leading to higher revenues for his company. In July, Senate Armed Services Chairman Sen. John McCain, R-Ariz., said the U.S. should supply Ukraine with the Javelin portable missile system produced by Lockheed Martin and Raytheon. “They need a Javelin,” McCain said, speaking at the Heritage Foundation. Through his relationship with RiceHadleyGates, Hadley works for APCO Worldwide, an international lobbying firm for which he serves as on the firm’s international advisory council. The RiceHadleyGates-APCO business partnership was announced in 2011. In March of this year, APCO won two contracts to represent the Ukrainian Prime Minister and Ukraine’s Minister of Finance to help influence relations with the American government and media. The Ministry of Finance has asked international creditors to renegotiate the terms of the country’s sovereign debt as Ukraine has struggled to make payments. Last week, Hadley weighed in on this topic, arguing in a column for the Wall Street Journal that Western powers should extend debt reduction for Ukraine. “The odds may be long, but the prize is great, and the trans-Atlantic community will never have a better chance to invest in Ukraine’s success,” Hadley wrote. But the funding — $40 million that year — was restored in committee. The institute, housed in a new $186 million palatial building overlooking the National Mall in Washington, D.C., is also supported by private donations, including a $1 million grant from weaponsmaker Lockheed Martin.